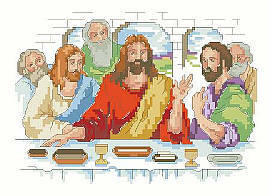 Jesus celebrates the Passover seder with his disciples in this intimate version of The Last Supper. The elements are on the table and he is blessing them as well as speaking with his followers. This small interpretation of such a momentous event is well designed by Linda Gillum. Contents: Stitch Count 90w X 70h, Finished size on 14ct 6 1/2" X 5"